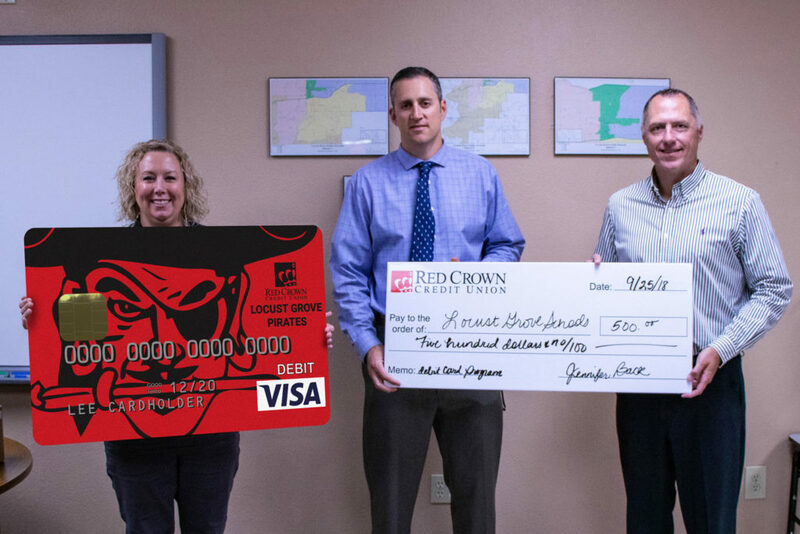 Red Crown Credit Union (Red Crown) is happy to announce our partnership with Locust Grove Public Schools (LGPS) for their participation with the Locust Grove Pirates Debit Card. 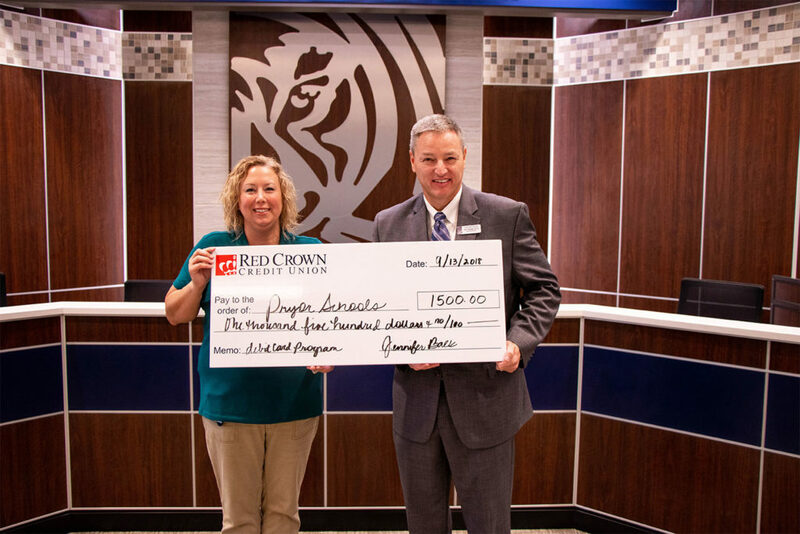 Red Crown made a $500 donation to LGPS for this partnership. “We are excited to partner with Locust Grove Public Schools and excited to work with them for years to come,” said Jeremy Daggs, Vice President, Marketing – Red Crown. Members of the Locust Grove community can stop by any Red Crown location to order their Locust Grove debit card. With every debit card swipe, Red Crown makes a donation to LGPS. Red Crown Credit Union (Red Crown) is happy to announce our partnership with MidAmerica Industrial Park. Red Crown was chosen as the first retail location to break ground in MidAmerica’s new multi-use development called “The District,” combining retailers, housing and public recreation areas. Set to open in 2020 The District will include 32,000 square feet of retail space, a 100-unit, multi-story living complex, 100 residential homes and 10 acres of parks and outdoor spaces connected by walking and biking trails, officials said. “Red Crown will occupy a space in The District and will be able to provide financial products and services to individuals who live and work in the industrial park,” said Mike Moyer, President/CEO – Red Crown. “Mayes County has been a great community for Red Crown. We are happy to be presented this opportunity and happy to serve the community members of Mayes County,” said Moyer. 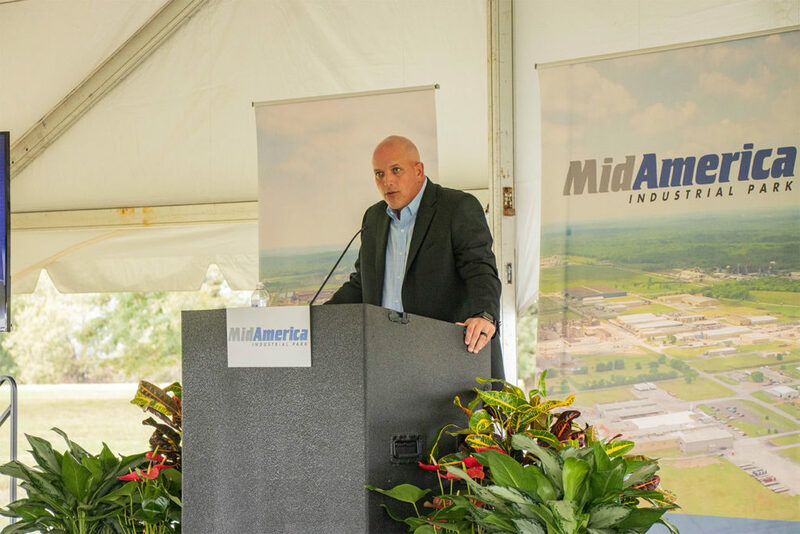 Picture includes, Mike Moyer: Red Crown President/CEO speaking at the MidAmerica Industrial Park ground breaking. Red Crown Credit Union (Red Crown) is happy to announce our new location for Claremore, Oklahoma, set to open in Winter 2018. Red Crown purchased the building that was originally Health Center Pharmacy, located at 113 W. Blue Starr Dr. “Our management team was in town for a planning session and we saw that the building was for sale,” said Mike Moyer, President/CEO – Red Crown. “We discussed it and felt that would be a great spot for a Claremore location,” said Moyer. 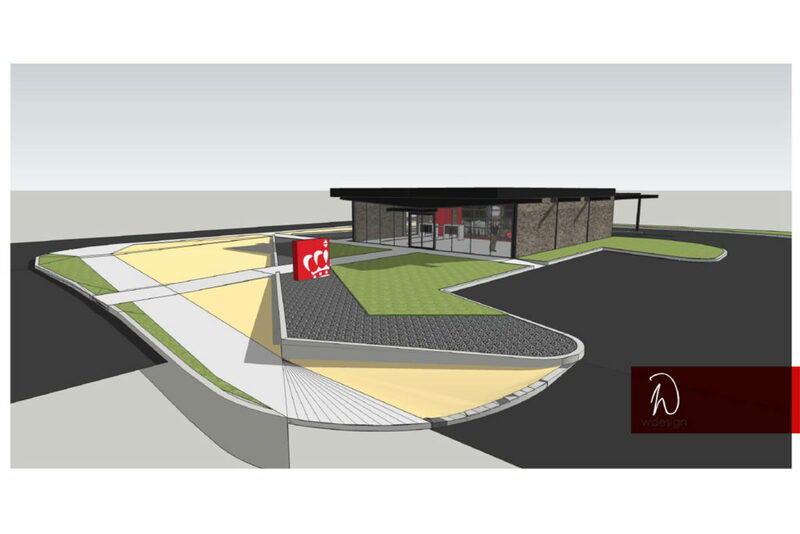 “This will be a full service location with a lobby, loan offices and a drive thru,” said Deanne Waguespack, Chief Operations Officer – Red Crown. “We wanted a vintage, but modern look, so we hired W Design out of Tulsa and we are very impressed with the work they have done,” said Waguespack. The picture above is a rendering of the location by W Design. 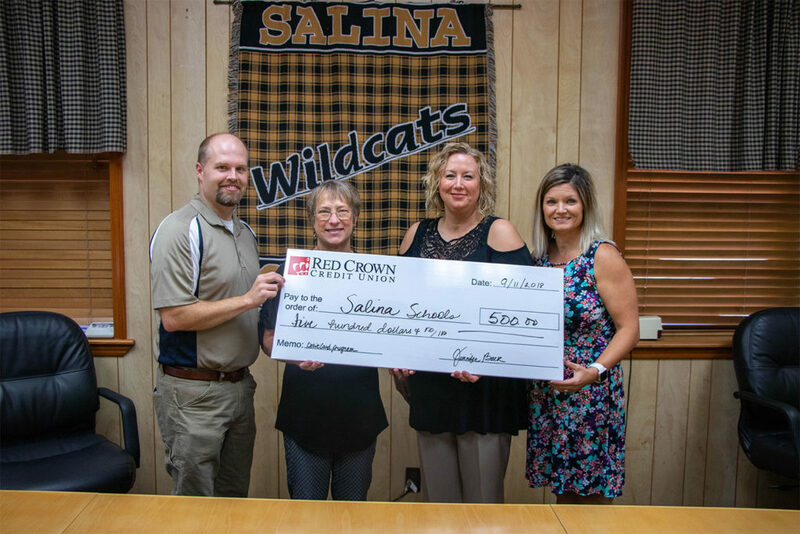 Red Crown Credit Union (Red Crown) is happy to announce our first full fiscal year donation to Salina Public Schools (SPS) for their participation with the Salina Wildcats Debit Card. Red Crown made a $500 donation to SPS, due to the debit card activity with the Salina card. “Each debit card swipe counts and the Salina card has 65 active debit cards,” said Jeremy Daggs, Vice President, Marketing – Red Crown. “The Salina community has been so welcoming to this program and we are happy to be a part of this community,” said Daggs. Members of the Salina community can stop by any Red Crown location to order their Salina Wildcats debit card. With every debit card swipe, Red Crown makes a donation to SPS. 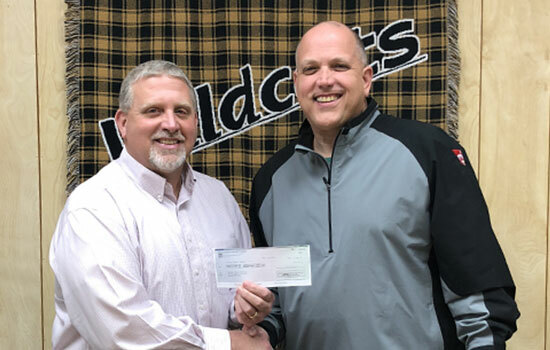 Red Crown Credit Union (Red Crown) is happy to announce our first full fiscal year donation to Adair Public Schools (APS) for their participation with the Adair Warriors Debit Card. Red Crown made a $800 donation to APS, due to the debit card activity with the Adair card. “Each debit card swipe counts and the Adair card has 112 active debit cards,” said Jeremy Daggs, Vice President, Marketing – Red Crown. “Adair Public Schools has been great to work with and we are happy with this partnership,” said Daggs. Members of the Adair community can stop by any Red Crown location to order their Adair Warriors debit card. With every debit card swipe, Red Crown makes a donation to APS. Red Crown Credit Union (Red Crown) is happy to announce our first full fiscal year donation to Pryor Public Schools (PPS) for their participation with the Pryor Tigers Debit Card. Red Crown made a $1500 donation to PPS, due to the debit card activity with the Pryor card. “Each debit card swipe counts and the Pryor card has 212 active debit cards,” said Jeremy Daggs, Vice President, Marketing – Red Crown. “Just think how large the donation could be with 500 cards,” said Daggs. Members of the Pryor community can stop by any Red Crown location to order their Pryor Tigers debit card. With every debit card swipe, Red Crown makes a donation to PPS. Red Crown is supporting the Folds of Honor Foundation with the Folds of Honor debit card. The Folds of Honor’s mission is to provide educational scholarships to spouses and children of America’s fallen and disabled service-members. With every swipe of the Folds of Honor debit card, Red Crown makes a donation to the Folds of Honor Foundation. In the last 17 months, $8,000 has been donated. Members can stop by any Red Crown location to order a Folds of Honor debit card. To learn more, visit the Folds of Honor Foundation webpage. 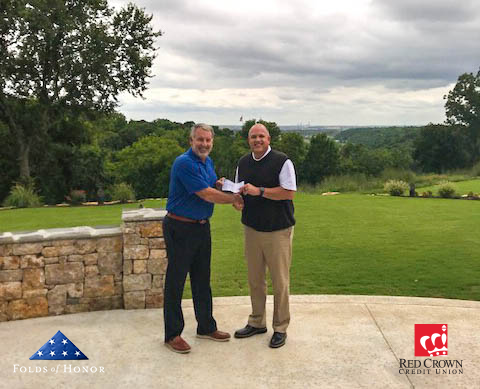 Picture includes, left to right: Folds of Honor Foundation Regional Development Officer, Dave Dierinzo and Red Crown Credit Union President/CEO, Mike Moyer. 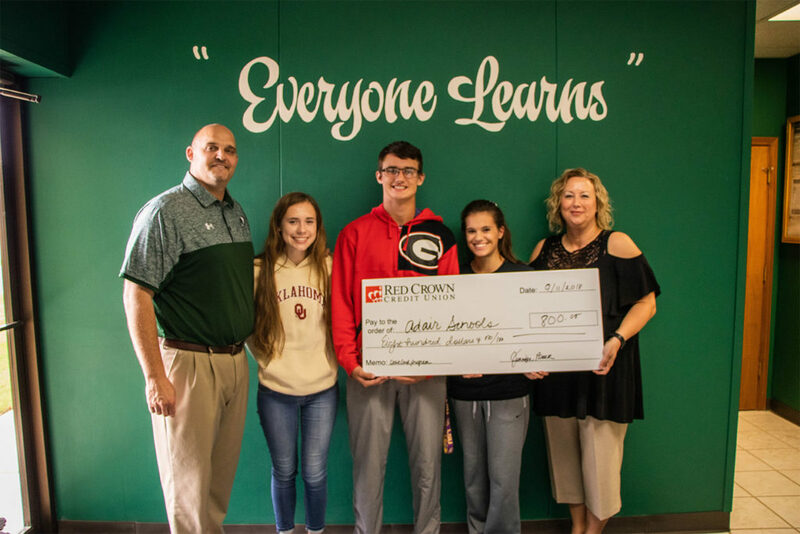 Red Crown Credit Union is supporting Salina Public Schools with a donation to purchase a new scoreboard for the Salina softball field. The scoreboard has been purchased, built and will be installed at the softball field in the next few weeks. Picture includes, left to right: Salina Public Schools Superintendent, Tony Thomas and Red Crown Credit Union President/CEO, Mike Moyer. 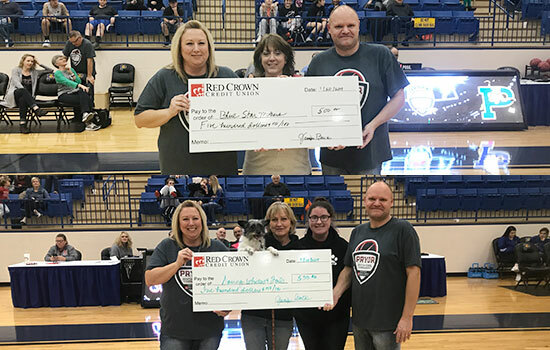 As a sponsor of the Pryor Invitational Tournament, Red Crown Credit Union gave back to the Pryor community by donating the 2018 Pryor Invitational Tournament shirt proceeds to Blue Star Mothers and Saving Whiskers and Tails of Pryor. Blue Star Mothers of Pryor is an organization of mothers who have children serving in the military or who are veterans. Their mission is to provide care packages to active troops. Saving Whiskers and Tails of Pryor rescues abused and abandoned animals. Their main mission is to give animals a safe place to live through adoption. 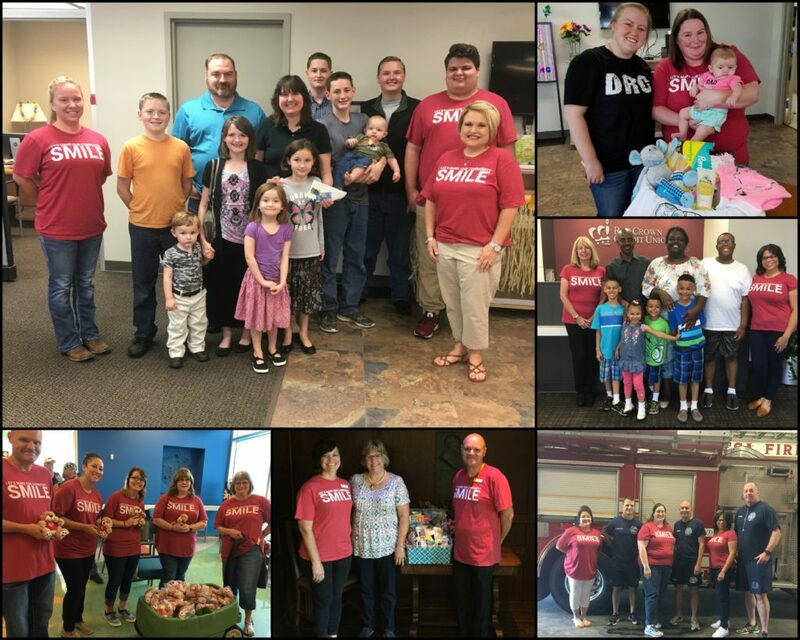 As a company, we strive to continually give back to our community. With the purchases of t-shirt sales we were able to donate $500 to each organization. Pictures include: Jennifer Back: Red Crown Assistant Vice President – Mayes County Branch Manager, Roy Kerns: Red Crown Mayes County Assistant Branch Manager, Representatives from Blue Star Mothers and Saving Whiskers and Tails of Pryor. Red Crown Credit Union has been named one of the 2017 Best Credit Unions to Work For in the United States. Credit Union Journal has partnered with Best Companies Group to identify companies that have excelled in creating quality workplaces for employees. This survey and awards program is designed to identify, recognize and honor the best credit unions. The list is made up of 45 credit unions. The full Best Credit Unions to Work For in the United States list is featured in the September issue of Credit Union Journal. Determining the Best Credit Unions to Work For in the United States involved a two-step process. The first step consisted of evaluating each participating credit union’s workplace policies, practices, and demographics. This part of the process was worth approximately 25% of the total evaluation. The second part consisted of employee surveys aimed at assessing the experiences and attitudes of individual employees with respect to their workplace. This part of the process was worth approximately 75% of the total evaluation. The combined scores determined the best credit unions and the final ranking. Best Companies Group managed the overall registration and survey process and also analyzed the data and used their expertise to determine the final ranking.